Walsine Pierce: CHANGING JOBS? Is The Grass Really Green On The Other Side Of The Fence? CHANGING JOBS? Is The Grass Really Green On The Other Side Of The Fence? 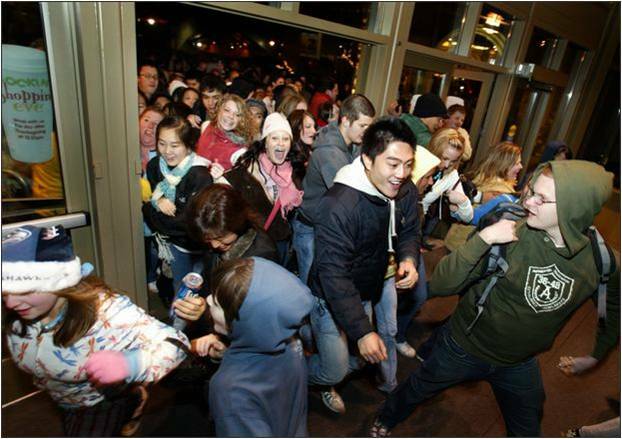 THE DOORS ARE OPENED FOR BLACK FRIDAY SHOPPING! BLACK FRIDAY! The day after Thanksgiving, the start of the holiday shopping, people can't wait. Well, actually they can. Standing in line, all night long if necessary, people wait for the "opening" hour. Everyone wants to be first to get the "BIG" bargain of which only a few are available. We had guests for dessert about 8:00PM last night. They were headed to stand in line for the midnight opening of several stores. After getting my Lincoln washed and serviced for an out-of-town trip early tomorrow morning, we were buying gas when we ran into an old friend. She had worked with my wife for 12 years. She had a secure job, that paid reasonable well--quite well for her minimum qualifications--with great benefits. She quit that job about a year ago, she took a job with a company competitor who asssured her the "grass was a lot greener on his side of the fence". It may have been, but now she is trying to get her old job back. 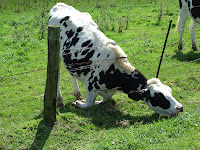 Yes, the grass may seem to be sweeter on the other side of the fence. I mean, don't cows, standing knee deep in grass, stick their heads through a barbed wire fence to nibble on the other side? What folks don't realize is that while the grass may in deed be sweeter, it may in reality be BITTER-SWEET! After all, all companies have rules and demands. Once you have made the committment, their demands may be far more agressive than those of your previous employer. During the 27 years I worked for one company, I was offered jobs by several other companies who really would have paid more money than I was making. Although the money sounded good, I knew that once I had solved the problems in the new company, I would just be another one of their employees. I stuck by my company and continued to advance. The grass on the other side of the fence had disapeared for one reason or another for this lady. Now, she and her husband were both working for a health institution for LESS THAN MINIMUM WAGE, no benefits, and were having a difficult time of it, as she told us. IN THE SAME BREATH SHE EXPLAINED THAT SHE WAS JUST RETURNING FROM BLACK FRIDAY SHOPPING. SHE HAD BOUGHT HER 16 YEAR OLD DAUGHTER A PAIR OF $120 BOOTS FOR $59, AND WAS PLEASED WITH HERSELF. Our housekeeper, Donna, just showed me a great pair of boots, although not designer boots, which whe had got on sale for even less than the $59. They were good boots, too, which she needed to clean the snow for me in the wintertime. Uh, yes, they take their good looks from me, un huh! Before making a life effecting decision, it is critical that an outsider's opinion be sought. When the mentioned lady quit her job of 12 years, she surprized everyone. When my three children, each extremely well educated and experienced--far more so than me--without fail, discuss any anticipated move with me. I seriously consider the situation from every angle I can imagine, and without trying to give a positive answer, I tell them just what I think, for and against, and give them my recommendation. The kids all do pretty well, too, although they make up their own mind after hearing what I think. That's the way it should be! IS THE GRASS REALLY GREENER ON THE OTHERSIDE? TAKE CARE THAT IT ISN'T REALLY JUST BITTER SWEET! HAVE YOU EVER NIBBLED THROUGH THE FENCE? Tell me about it, I love to hear.